Ren was an orphan who was abandoned outside a port warehouse as soon as he was born. According to Nobuo Terashima, the incident was even reported in the news. Subsequently, he stayed at the same orphanage as Yasushi. After Yasu was adopted by the Takagis, Ren frequently visited his friend, so much so that Yasu's foster mother offered to adopt him, an offer which he refused. Later, he formed a band, Blast, with Yasu as leader/drummer, himself as bassist, Nobu as guitarist and Nana Osaki as lead vocals. He also fell in love with Nana. (Like his idol, Sid Vicious, Ren wears a a chain with a lock around his neck that has the initial, "R" on it, to which only Nana has the key.) Blast was moderately successful in their town, but Ren doubted that they would make it big. He was offered to join Trapnest but declined because of Nana. With Yasu convincing him, after a while he then joined Trapnest as their lead guitarist. Their leader, Takumi Ichinose(Trapnest's bassist), is a good friend of Yasu as well. As he left Blast, he also tearfully broke up with Nana. After Hachi (Nana Komatsu) learnt about his relationship with Nana, she invited Nana to Trapnest's concert back in her hometown. The couple made up, but Nana promised Ren that Blast would become more popular than Trapnest; their new bassist, Okazaki Shinichi, wanted to surpass Ren himself. Although the couple had made up, Ren was still afraid that Yasu may become his rival for Nana. Also, Nana was uncomfortable with Trapnest's vocalist, Layla (Reira Serizawa), who seemed to be interested in Ren as well. To make matters worse, a tabloid magazine, SEARCH, was determined to expose the couple's relationship, as Blast's popularity had been rising steadily. After his relationship with Nana was found out by SEARCH magazine, Ren proposed to Nana because he felt that Yasu was going to take Nana away from him. Nana accepted but they both felt unsure about the marriage. 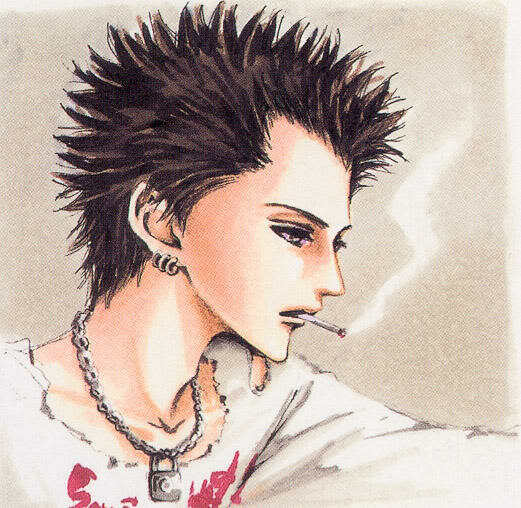 In the manga, when Shin was caught smoking marijuana, Ren ended his relationship with Nana. Five years later Nana is rumored dead but Blast and Hachi are still looking for her. Hachi's only wish was that Nana and Ren be together, implying that they haven't reconciled since.